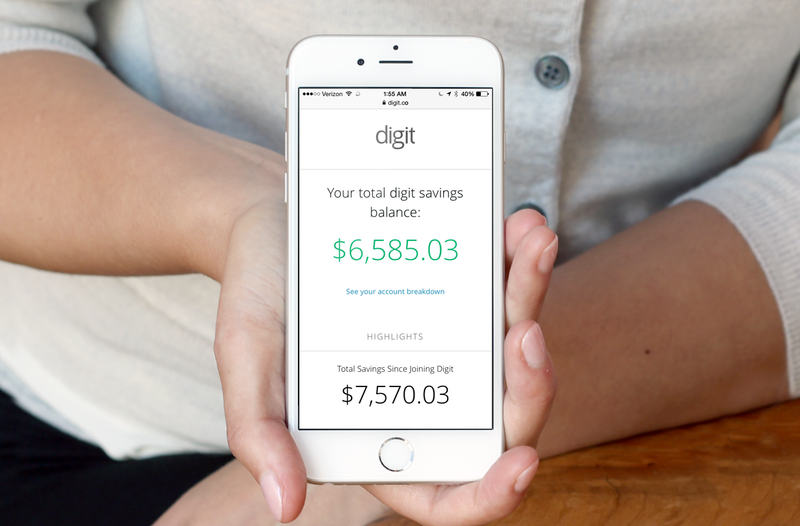 Apps like Digit can help you save, even when you don’t know where to start. | Image courtesy of Digit. We live in the 21st century, but most apps that deal with money are living like it’s 1999. If you want to find high-tech ways to save better and more efficiently, you need to check these out. After all, the majority of Americans stress about money, and stress is bad for your health. In case you didn’t know, Americans are bad at saving. Really bad. In fact, 60% of Americans between 18- and 40-years-old saved absolutely nothing in 2013, according to the Federal Reserve. And adults under 35 actually lost 2% of their savings that year. With 128-bit bank-level security, you don’t have to worry about hackers any more than with a normal bank, and any money you put in is also FDIC insured up to $250,000. Digit is also so confident in its savings algorithm that if you need the money ASAP, and Digit took out too much, you don’t have to pay any over-draft (taking out too much money) fees. Summary: If you’re not saving any money now or are not disciplined enough to put cash away, then Digit is for you. But you’re already regularly saving and want to make decent (in today’s world) bang for your buck, you should consider putting your savings into a high-earning savings account through an online bank, like Ally. LearnVest is online budgeting, goal-setting software that accurately monitors your savings, spending, and loans, so you can see your actual net worth in real time. The website connects to your bank accounts and acts like a one-stop portal for your finances. Through LearnVest, you can create a budget and set financial goals. Like other budgeting software, LearnVest uses a “folder” method, where you can place expenses into appropriate categories like groceries, entertainment, or transportation. The website does try automatically place expenses where they should go, but sometimes you need to enter the folder yourself .LearnVest also breaks down your budget into fixed and flexible income so that you can easily see how much you have in each category. What separates it from others in the category is the ability to set and track goals. Then, as you add money toward the goal, you can visually see your progress. The only downside is you can only set one goal per savings account, so you may have to get creative and combine multiple goals into one. SUMMARY: LearnVest is great for people with multiple online accounts who want an easy way to see there expenses, savings, and debts in one place. While it is a good budgeting app, it’s not a great one, but you can set goals through the app and visual track them. YouNeedABudget is an oldie but a goodie, and it’s constantly making best budgeting apps because if you have the time, it will teach you discipline. One of the best and worst features of YouNeedABudget is that you have to manually enter every transaction. I’m sure by now the software could easily link to your bank accounts (it doesn’t) and get that information, but the real power of it is that you know exactly how much you’re spending each month. The catch is that you have to have the discipline to use it regularly. If you can get in the habit of inputting your expenses, YouNeedABudget is one of the best monthly budgeting programs out there, helping you to break down spending by category and microcategory. It also automatically does the math and carryovers for you, so you just need to do line-by-line expenses. Summary: YouNeedABudget is good for people who are discplined time-wise, but aren’t so budget-savvy. It’s also good for visual learners who need to see exactly how things break down, and for people who don’t want their account information directly linked to a program. It’s not so good for people who just want an overview of their finances or don’t have the patience to enter things item-by-item. Did I miss your go-to finance app? Share your favorites (or least favorites) in the comments below!